Explaining complicated things is not always an easy task, especially when talking microscopic biological processes. Learn how the Technical University of Denmark now use mixed reality to pave the learning curve. Last week we had the honor of presenting our mixed reality solutions to none other than HRH Prince Joachim of Denmark, as he inagurated the new science building at the Technical University of Denmark (DTU). 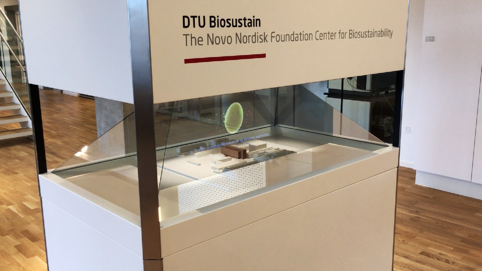 The new building is home to the DTU Biosustain, a department of the university that focuses on the sciency stuff happening on the very small and microscopic level. As a result, explaining the tiny details and fascinating biological processes in an understandable matter, often becomes complicated - very complicated to say the least. The team at DTU was looking for an engaging way to visualize the specific biological processes that occurs for yeast cells, to visualize the important work being done to everyone visiting the new building. The team at DTU together with Realfiction decided on a large custom build Dreamoc to fit the entrance hall of their new university building. Realfiction creative partner Animmersion headed the development of the holographic content, which was to explain these complicated biological processes to visitors of the university. Based in the UK, Animmersion was presented with a draft storyboard from the team at DTU, which outlined the main points that was to be visualized and animated. Having a lot of experience in working across countries, Animmersion used internal visuals and models of the biological processes as the starting ground for creating the holographic content. They then adapted and repurposed it to fit the custom Dreamoc format and overall storyline. After designing, Animmersion went to test and edit the content to fit a real wooden model of the university, which was to be placed inside the display. “We were very happy to be part of this project to create an interesting view into this microscopic world, and make it easier for everybody to understand”, said Dominic Lusardi of Animmersion. 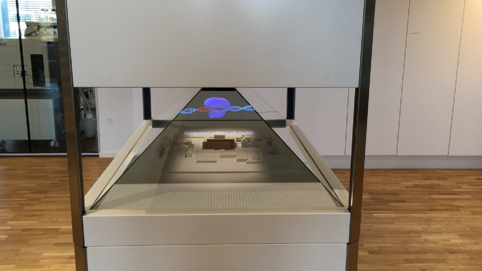 “ It was also a great way of using the holographic display in a different setting than commercial retail or expos, and instead use it directly as a learning tool".